Wait! The absence of verbal directions in Japanese supermarkets, a photo by timtak on Flickr. Have you ever asked a Japanese shop assistant where something is? If you are in the UK and lucky, the shop assistant will grunt or otherwise convey the isle number like this "far end of isle 16, love,". In Japan however, even though the isles have numbers, the assistants will not give you verbal directions to the isle, but rather rash off off expecting (presumably) that you sprint after them. 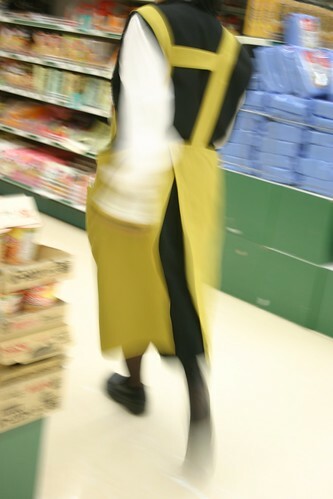 This is a photograph taken by me of the back of a shop assistant taking to me to where I can find coarse grained mustard, in a supermarket in Japan. Not merely being told, but being escorted to the destination one seeks is in some ways an increase in the standard of service, but in others it is a pain in the neck, or legs. The shop assistants run too fast (hey, I am carrying a shopping basket remember!) and I would rather go to the correct isle in my own time in the proper order as dictated by my itinerary. I snake my way through supermarkets, going through each of the isles. I don't want to be escourted to the far side only to have to find my way back to my snaking path. If they told me the ilse number, I could find the mustard when I get to the relevant isle in my own time. I believe that Japanese shop assistants find it difficult to put an isle number to the place. They store the information about where products are shelved spatially, and spatially is the only way that they feel confident in retrieving it. Sometimes I have physically held them down, and insisted that they tell me the isle number. The unhappy response in this situtation is that without out going to the place where they think the required item is, they can not be sure that it is in fact there. If you can speak Japanese, try it next time you are in Japan. Masuta-do wa nanbanme no retsu deshou ka? And get ready to run. Typically verbal directions are not given when visiting houses and business but rather one relies on maps. This is partly due to the Nacalian imago-centrism of the Japanese and as a knock on effect to the way that plots of land are given numbers in little obvious progressing, rather than street numbers as in the West. In the West it is possible to find a house or business establishment armed with a street number and street name (and a few directions from the nearest station) whereas in Japan having a land plot number in a certain area will still leave you guessing as to where within the area the number corresponds. Usually therefore people give others maps if they want them to find their house or business location. I think that perhaps we even enjoy telling people how to get to places by taking the third right, fourth left, and so on, just as the Japanese rather seem to enjoy drawing and using maps sometimes as a hobby and form of virtual tourism (see, Hori, 1972; 2010, Imao 2012). Takahiko Masuda (Masuda, Gonzalez, Kwan, & Nisbett, 2008) has found that East Asians are good at and tend to draw the birds eye view diagrams typical of Edo period guidbooks called "named-place-picture-collections" (mesihouzue) . We like to give directions in signs, Japanese in the form of indexes (pointing) and images.